If you consider yourself a true ninja, then show your pride for the village! Take a look at these forehead protectors with all the hidden villages’ symbols including that of exiled Akatsuki ninjas: Konoha, Rain, Sand, Stone, Waterfall, Mist, Sound, Grass, Wave. 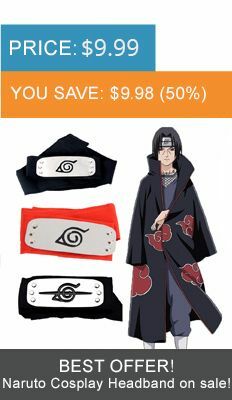 It looks exactly like in the anime and is perfect for ninja look – wear it for cosplay or just for fun! This particular headband is a necessary part of your cosplay costume which will make everyone jealous and help you steal the show.